The following information has been prepared to answer some of the questions we frequently receive about pre-arrangement. Why do people pre-arrange a funeral service for themselves or a family member? There are many good reasons. Some plan ahead because there will be no one who is capable of making responsible decisions. 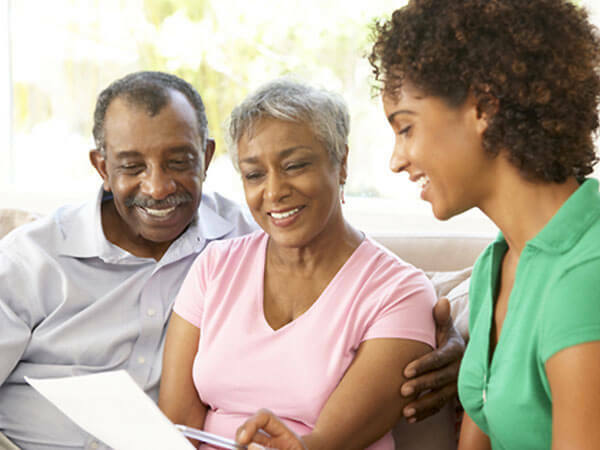 Others have a definite preference concerning their funeral service, and they want their families to be informed and involved in those decisions. What steps are involved? After you determine your funeral preferences, we will explain your options and guide you in establishing your own plans. You should find the advice of your family, clergy, and your funeral director especially helpful when considering the options. We will record certain vital information and gather documents for the required forms. What will the pre-arranged funeral service cost? The cost is based on your choice. All of your selections and options are featured in our itemized pricing guide. This guide provides factual information concerning each item and its price. Who Qualifies? Individuals between the ages of 0 and 99 may apply. No medical examination is required for the life insurance, just a simple questionnaire that is completed after advance funeral plans have been made. Increasing Death Benefits - Reduce the impact of inflation, which would otherwise increase the cost of your funeral. Extended Payment Options - Our insurance plans are underwritten by Fortis Family Life Insurance Company. There are various payment options available. Even people on a tight budget can gain the advantages of funding their pre-planned funeral service. How Do You Pre-Pay For A Funeral? - You may select one of two ways to pre-pay for a funeral. Pre-Payment In Full - The first method is to make payment in full. This will guarantee the price of the funeral and merchandise selected. Pre-Funding Through Life Insurance - Pre-funding funerals is a growing trend in America because of the peace of mind that comes from having one's affairs in order. Funding those arrangements with insurance coverage or a trust are the two ways we handle pre-funding. Your Funding Is Secure - Your funding is backed by Fortis Family - and industry leader for more than 60 years. Today, Fortis Family provides preneed insurance with nearly 1.5 million policies. They consistently earn high marks for financial stability from the top financial ratings companies in the country. Tax Free Value, Tax Free Death Benefits - Our plan provides life insurance benefits that are exempt from federal income tax when paid to a named beneficiary. Neither the increasing value of the coverage nor the total benefits paid at the time of death are federal income taxable. Ensure your affairs will be administered after your death correctly. A properly prepared will is essential. Without a will, your property and holdings will be distributed according to law and a court will appoint an administrator to probate your estate. Contact your attorney soon if you do not have a will. If you do have one, review and update it regularly. To start your pre-arrangement please fill out the form below.